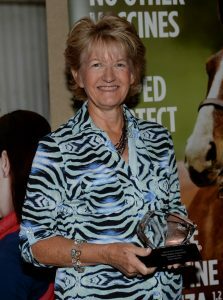 Sydney Knott, founder, president and CEO of Horses4Heroes, was named the recipient of the 2017 Equine Industry Vision Award. Zoetis, in partnership with American Horse Publications (AHP), presented the award to Knott at the AHP Equine Media Conference in Scottsdale, Arizona. The Equine Industry Vision Award is the first to showcase innovation across the equine industry. Established and sponsored by Zoetis, the award recognizes ingenuity and service, and works to inspire those qualities in others. Through Horses4Heroes, Knott has introduced more than 20,000 men, women and children to horses and horseback riding. The program started in Knott’s Las Vegas backyard in 2006 as a community service project. The family gave weekly free horseback rides to military, police, firefighters and other local heroes as well as their families. These weekly rides grew into requests for riding lessons, and today has grown to become a national nonprofit with affiliate locations in 45 states and Canada. “The focus of Horses4Heroes has always been to make riding affordable and accessible for all. You have to give them a chance to fall in love,” said Sydney Knott. “One of the driving factors to our expansion has been the fact that military families often relocate." Horses4Heroes is continually growing to meet the interests and needs of its community. Knott has added Operation Free Ride, open riding time for returning combat veterans and their families to try horseback riding and receive instruction; HorsePlay, a mommy-and-me weekly class for mothers and young children; Ladies Unbridled, a ladies-only weekly riding group; community events; camps; birthday parties; field trips and more to continue the mission of exposing newcomers to horses. Knott relocated Horses4Heroes to its national headquarters and flagship facility, the Horses4Heroes Community Equestrian Center, in 2014. The headquarters is located in historic Floyd Lamb Park, a 680-acre Las Vegas city park which was once a working cattle ranch. It was made possible through partnerships with Associated General Contractors of Las Vegas and Cox Charities. Horses4Heroes is a two-time winner of the American Horse Council’s Time to Ride Challenge in 2014 and 2016. Knott credits strategic partnerships with The Trail of Painted Ponies and local businesses with their success in Time to Ride; however, she recognizes Horses4Heroes’ true success is in the families they opened the doors to that are now a part of the equine industry. American Horse Publications has united equine-related publishing media, businesses, professionals, colleges and students for nearly 50 years. The nonprofit professional association promotes excellence in equine publishing media and encourages relationships and communication to increase interest in the horse industry. For more information, visit www.americanhorsepubs.org.